There are many things to love about Confession. The plot is original and twisted enough to make you question if you’ve really figured out who did it and the pacing is timed just right to keep you turning the pages. In real life, author Carey Baldwin is a doctor who holds two doctorates, one in medicine and one is psychology and her expert knowledge in these fields is clearly evident throughout the story. Dr. Faith Clancy, our psychologist heroine, is well developed. She’s a smart woman who isn’t afraid to move alone to a new city and set up a new practice, she’s independent, thoughtful, cares about her patients and still has enough flaws in her personality to be interesting. SPOILER ALERT. STOP READING NOW IF YOU DON’T WANT TO KNOW ANY PLOT DETAILS. There is a developing romance throughout Confession between Dr. Clancy and Luke Jericho, brother of the confessed serial killer Dante Jericho. I don’t think this romance added much to the story and it detracted from the search for the killer. There is one point in the book where Dr. Clancy & Luke are thisclose to stopping the killer before he claims his next victim. And they thought that was the perfect time to stop and have an emotional embrace, which sucked all of the building serial killer tension right off the page in the middle of the scene. If the synopsis had been about a romance that develops during the chase for a serial killer, I probably would have loved almost everything about this book. But it was described as a psychological thriller so I didn’t get what I expected because there were too many other things going on that diminished the building suspense. I think Confession is a book that will inspire a variety of opinions and I’d love to hear yours. Pick up a copy at your favorite neighborhood bookstore, head back here after you read it and share your thoughts. I bet we all take away something different, which is one of the wonderful things about reading! You can also purchase online from Beyond Just Books, Barnes & Noble or Kobo Books. We’re giving away a free copy of the book to one lucky reader. To enter to win, simply comment on this blog post with your name and tell me the best book you’ve read in the last year. We’ll randomly select one winner on Monday, April 14, 2014 at 8pm CST. If you are chosen as the winner, you will then be asked to provide your USA mailing address so we know where to send your copy of the book. Sounds like this mystery should definitely be on my TBR stack! Thanks so much for sharing your thoughts on it with us. I’ve enjoyed reading Sarah MacLean’s scoundrels series, and I think I’d like reading a thriller with a major romance angle so please enter me in the giveaway. THank you! Please enter me in the drawing. I just finished I’ve Got You Under My Skin by Mary Higgins Clark. That was a good one. 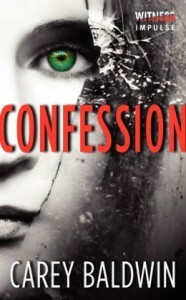 Please enter me in the giveaway for Confession!